Life's Journey To Perfection: Sharing Time February 2014 Week 4: Agency is the gift to choose for myself. 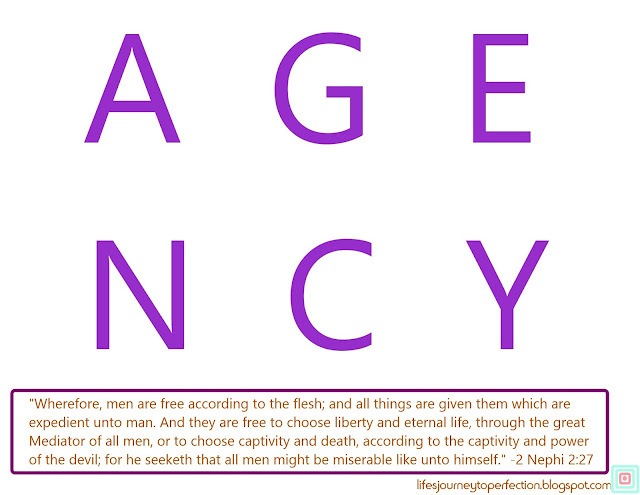 Identify the doctrine: Agency is the gift to choose for myself. Have six brown or white paper bags. Inside of these bags place one of the letters that spells out AGENCY. Help the Children Understand the Doctrine: Prepare to have someone read 2 Nephi 2:27. Prepare to discuss how we used our Agency in Heaven and the consequences of our choice. Help them apply the doctrine in their lives: Prepare to play the "Choice and Consequence "game with the two stacks of cards. See free printables below. Begin the sharing time by having the six bags on the table. Invite a primary child to come up and choose one of the bags. Once, they have chosen a bag have them open it and take the letter out and place it on the board. Invite another child to come up and choose a bag, have them open it ant take the letter out, continue until all of the bags have been opened. Explain, that the letters that on the board spell a very important word. This word is what the great war in Heaven was about. We used this gift to choose who we would follow in Heaven. The children used this gift as they came up and choose a bag. Ask if any of the children could come and arrange the letters to form this word. If they need help, coach them along or see if a teacher could help. After the word, AGENCY is spelled out correctly, ask the children to repeat the word with you. Explain that agency is the gift our Heavenly Father has given us, it allows us to choose for ourselves. We make the choice and from what we choose there is a consequence. Read or have an older child or teacher read 2 Nephi 2:27. Explain, that when we were spirit children in Heaven we used our agency to follow our Heavenly Father and Jesus. Lucifer wanted to take our agency away. He wanted for us to come to earth and be forced to follow the plan. But, our Heavenly Father knew how important our agency is. His plan was for us to come to earth and learn and grow and make choices for ourselves. With every choice we make their would be a consequence. We know that each of us who have gained bodies, used our agency in Heaven to follow our Heavenly Father and Jesus. Because, we made this choice our consequence was that we were able to come to earth, gain bodies, experience mortality and be resurrected. Those spirits who used their agency in Heaven to follow Lucifer had the consequence of being cast out of heaven, to never receive a body. Explain, to the children that we use our agency everyday. In every decision we make we are using our agency. Tell the children that they are going to play a little game. In this game they are going to use their agency and by doing so they are going to experience a consequence of what they choose. Show them that you have two stacks of cards. One stack of cards is the ACTION pile, the other stack is the QUESTION pile. They can use their agency to choose which pile they are going to take a card from. Their consequence is that they will have to do what the card says. 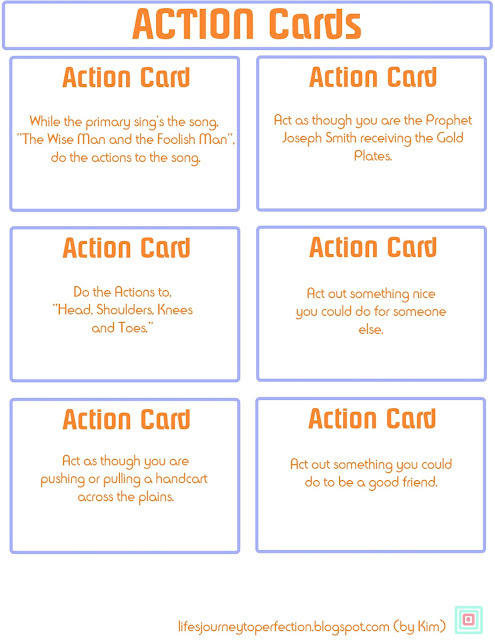 Example: If the child chooses a card from the ACTION pile, the card might say, "Do the actions to the song, "The Wise Man and the Foolish Man"." So, then their consequence for choosing that card would be to do those actions to the song. 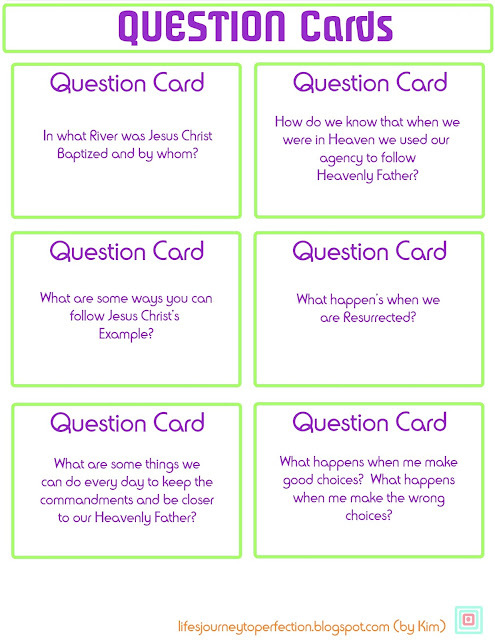 Or if a child chooses a card from the QUESTION pile, the card might say, "What are some ways you can follow Jesus Christ's example?" Their consequence for choosing that card would be that they would need to answer that question. Continue, until all cards have been chosen or time runs out. Explain to the children that we have our Agency to choose the things we are going to do in life, but their will always be a consequence for that choice. If we have made a good choice, then we will have a positive consequence and will be happy. If we make a wrong choice we will most likely be unhappy and have a negative consequence. Bear your testimony about agency and consequences. o How do we know that when we were in Heaven we used our agency to follow Heavenly Father? a) Because we have bodies and are here on earth. o What are some ways you can follow Jesus Christ's example? a)Pray always to our Heavenly Father, teach others the gospel, serve others, be baptized by immersion by proper priesthood power, love others, etc. o What happens when we are resurrected? a)Our bodies are made perfect and reunite with our spirits. They can never die again. o What are some things we can do everyday to keep the commandments and be closer to our Heavenly Father? a)Read our scriptures, Pray, Attend our Church meetings, Serve other people, Listen to the Holy Ghost, etc. o What happens when we make good choices? a) We have happy, positive consequences. What happens when we make wrong choices? a) We have unhappy, negative consequences. If we sin we need to repent. Great idea! I was coming up with a game, but I like yours better. Danielle- Thanks for your nice comment! I liked having a game for this sharing time, because it was a great way to show the kids their agency to choose and consequences. Hope your sharing time goes great! Kim ! You're a lifesaver! It's currently 9 o'clock on a Saturday night and I just haven't had time to even think about sharing time this week. I knew your idea would be perfect! Thanks for the comments! I love receiving them. It makes me happy to know that others can use some of my ideas! Thank you so much for this weeks sharing time ideas. I used it in combination with the opregular outline. The primary children had fun doing the action cards. They got creative.